Arrrr....Captain Jack Sparrow holds court outside the Pirates of the Caribbean attraction to enlist budding pirates in joining his crew. Alongside Captain Jack is Mack, his steadfast shipmate. Together they'll teach you the secret of being a swashbuckling, sword wielding pirate on the Adventureland Promenade Stage. These guys do a great job. 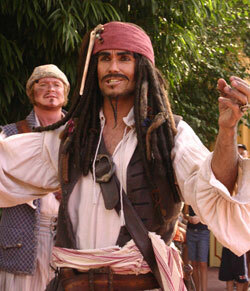 The Captain Jack character has the same quirky mannerisms as Captain Jack in the film. The kids who are enlisted to take the Pirate Oath will have ear to ear smiles. Performances are at 10:15 AM, 11:20 AM, 12:25 PM, 2:15 PM, 3:20 PM and 4:25 PM. Be sure to check the Times Guide for any changes. 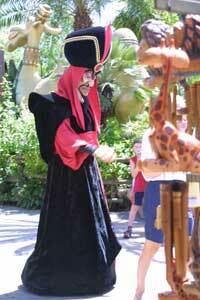 Character congoasis (across from the Enchanted Tiki Room). 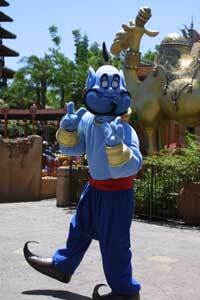 Check Times Guide or ask a cast member for exact times and characters.